Playing in a small college program, Rice attracted attention while teaming with QB Willie Totten in a spread offense. 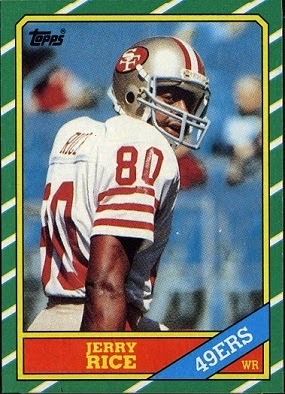 He caught 102 passes for 1450 yards in 1983 and 112 for 1845 yards and 27 touchdowns in ’84. Along the way, he had a 24-catch performance against Southern University. Drafted by the 49ers in the first round in 1985, Rice moved into the starting lineup as a rookie and, despite a slow start, diverted coverage from veteran WR Dwight Clark and showed flashes of future greatness. 49ers went 10-6 to finish second in the NFC West while qualifying for the playoffs as a Wild Card entry. Lost NFC Wild Card playoff to New York Giants (17-3). Following his promising rookie season, Rice broke out with 86 receptions and led the NFL in receiving yards (1570) and TD catches (15) in 1986. He was a consensus first-team All-Pro selection for the first of five straight years (and ten overall) and was chosen for the Pro Bowl, an honor he would receive on 13 occasions. Rice went on to play 20 seasons in the NFL and re-wrote the record book by the time he was done. The 1986 season was the first of 11 straight thousand-yard receiving seasons and 14 overall. He led the league in that category five more times, including a then-record 1848 in 1995. Rice also had four 100-catch seasons and was the NFL leader twice. A prolific scorer, he had a total of nine years in which he reached double figures in receiving TDs and paced the league six times. After 16 years with San Francisco, Rice moved on to the Raiders for three full seasons plus part of his last year, in 2004, in which he finished up with Seattle. Overall, he retired as career leader in pass receptions (1549), receiving yards (22,895), receiving touchdowns (197), and total TDs (208). He gained the most total yards (23,546) of any player in NFL history. Rice was inducted into the Pro Football Hall of Fame, Class of 2010.